This is the main page for g.static. 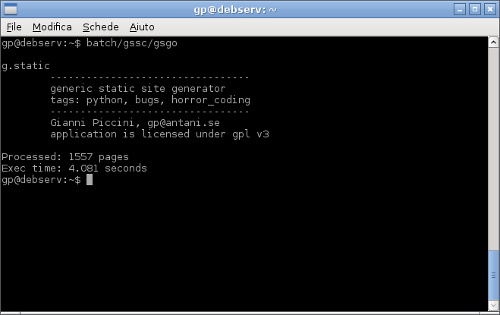 g.static is a simple (and probably really bugged) static site generator (it still stands in 4893 code lines), that I wrote with Python 3.7.3rc1, to generate pages for this site and for the others I own, like antani.se. First of all, this is a project that I'm doing due I would see how Python works, and is modelled on my use. I decided to use Python for this, due its flexibility, and the big number of code examples that I can find. So, you're free to get and modify it, to use it, but it is not military-grade secure and rock solid. You will find a bad and slow code, a stupid implementation, but that is: I prefer to had a bad application working as I like, instead of a nice piece of code that is unfinished forever, and I've not to show my ability in programming, this is only an utility that I would use due using cms is slow and needs a constant work. I've had also problems with other static files generators, many times they are powerful, but need to compile a lot of files, templates, etc etc. Main difference from other static generators is that they would to apply styles and structures to texts, while I would only to create files following a raw html skeleton. License I use for this is GPL v3. The goal of the project is to get a complete site from text files, trying to don't have to use terminal a lot of times: you'll put a text file and an image in a directory, and you will have on return the complete web page using html5. At least in my wishes, I would create a generator that mostly uses defaults, but could be capable to do hard changes to pages. It's no hard to comprise: simple, bugged, works only in some conditions, when it works it should be useful. As a consequence, there are more things that users have to know about style sheets, due they're used but not managed in toto from the application: classes are added to the tags, but you've to set into css file. Actually, the only necessary dependency is ImageMagick, you can need Openssl installed only if you want to make automatically .htaccess files. I'm perfectly aware that there are some incongruences in the program stream, some thing to be changed, and that some other methods would be better for some works. But I'm not trying to do a clone of a better application, I would write a really simple to get own site. I know that in some situations application fails, and (I don't justify me for bad programming, I think I've done good programming only in the '90s) I'm in that situation due I don't want to put users in a jail. As you can see, there is a big lack of documentation. I'm trying to write a readable version, but I need time :-) It should be multiplatform, at least usable with Windows (™, ®, ℠, ©, ℗), but I've stressed application only with this pc: it should work, I've create and deployed a site on a test machine, but I can't be sure. I've not tested application with Windows version of Openssl, too, feedbacks welcomed. It should run, without modifications, also on Mac computers. Please note that I focused on contents more than on apparence: there is not reason to avoid use of complex layouts, but it's up to you modifying of css and styles, at least in the actual version. Templates are less powerful, but simplier than in other apps. Thinked to be used within a cron command, using text files for contents. Operations are done via a configuration file, that stays in /site directory. Use of simplifyied templates as keywords, like in python templates. Formatting trough Markdown, trough the use of Hsiaoming Yang's Mistune. Create galleries of images, and automatically upgrade them. Can include custom commands results into the pages. Multilanguage sites creation without creating branchs and multiple pages. Poor (or simple) automatic formatting, avoiding complex ways. Try to simplify use, remove some of hardcoded css classes, reorganizing chunks and increment their use. The possibility using gStatic under Windows. You can find gstatic on my repository on GitHub. This is the direct link to the master branch.